next April 6, 2015 2:24 p.m. If the idea of a &ldquo;surgical robot&rdquo; conjures up images of a humanoid cyborg preparing to slice into your guts with the circular saw built into its arm, you&rsquo;ve probably seen too many movies. If the idea of a “surgical robot” conjures up images of a humanoid cyborg preparing to slice into your guts with the circular saw built into its arm, you’ve probably seen too many movies. The da Vinci Surgical System, which has helped doctors perform more than a million surgeries since it was introduced in 2000, is nothing like that. 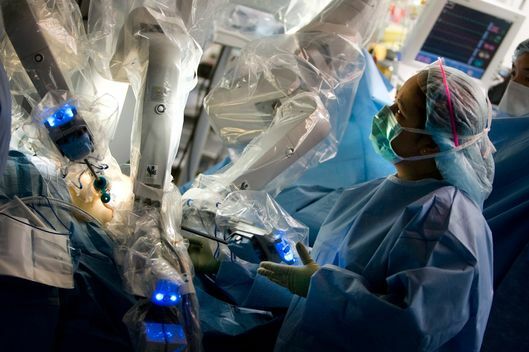 Rather, it’s “an extension of the surgeon,” says Catherine Mohr, head of medical research at Intuitive Surgical, the country’s leader in robotic surgical technology. The da Vinci system, while not without its detractors, points to a future in which surgery is safer, more precise, and less disruptive to a patient’s life. We recently spoke with Mohr about her company’s flagship product and if we’ll ever a see a day when the robots cut out the middleman and perform the surgery themselves. First of all, what are surgical robots? People tend to think about autonomous robots when they think of surgical robots. That is not at all what a surgical robots is. A surgical robot is an extension of the surgeon. It allows the surgeon to see inside the body and to manipulate inside the body. So a surgeon’s eyes and hands do not go inside the body through a large incision. Instead, surrogate hands and eyes go in through a small incision. How does da Vinci Surgical System work? The surgeon is sitting down at a console and looking through a stereoscopic viewer. It’s true 3-D imaging. They see the instruments and their hands. Their hands are holding onto these little instruments that look like little scissor handles and when they open and close those little controllers, the instruments inside are opening and closing. When they move their hands, the instruments are duplicating exactly what it is they’re doing. Is that a difficult process for surgeons to learn? We find some open surgeons take to it immediately, because it’s very much like they’re doing open surgery. It’s really a tool. You’re learning how to use a tool. When my daughter was 5 years old I sat her down at the console and pretty soon she was picking up rubber bands and handing them back and forth. How does it improve on a human surgeon? The biggest benefit is that you don’t have to cut a hole big enough to get hands inside the body. A lot of what people are recovering from after surgery is not what we did inside but what we did outside in order to get to the issue. If I had to pick the biggest benefit, it’s that it turns open surgery into minimally invasive surgery. But there are other benefits — enhanced visualization, tremor reduction. That’s about reducing the tremor from a surgeon’s hands? Yes. Human tremor is in a very narrow frequency band, and we filter that out. Though most surgeons don’t have significant tremor. That’s not terribly compatible with practicing surgery. Do you think we’ll reach a place where robots can operate without humans? It’s going to be quite a while. Artificial intelligence is really what that requires, where it’s making decisions based on things that are changing. We’re pretty far away from being able to take the surgeon out of the loop. What we’re closer to is being able to provide the surgeon with some sort of artificial-intelligence decision support. We can augment the human with AI rather than thinking we’re replacing the human with AI. What do you mean by artificial decision support? There are all sorts of conditions in surgery a surgeon might not be able to detect. An AI system could detect them and say you might want to go a little more slowly. It’s giving you information outside of what you immediately have at hand, which makes you change the way you’re operating. In general, people are kind of scared of robots. So surgical robots must be horrifying to some patients. How do you convince people these aren’t evil? They’re scared of robots when they have the Terminator: Rise of the Machines in mind. I don’t think, in most cases, those fears persist past their understanding what the robot does. It’s really the surgeon operating on them. And they must be interested in a more comfortable recovery. What else can da Vinci do for them? Yes, it’s a comfort in recovery, but it’s also avoiding big complications associated with those larger incisions. But we also have fluorescent imaging that allows you to tag where the blood vessels are. Hopefully, in the future, we will have tags for many different things like cancers. When you combine those with the special cameras we can put on the robot, it could allow surgeons to be absolutely sure they’ve gotten all the cancer out. With these super-fine dissections and high magnification, I believe we can improve patient outcomes. What’s on the horizon in surgical robots? I think you always have to start with the problem you’re trying to solve, not what new technology can we bring. So as the clinical problems are changing, we will be changing what kind of robotic systems we come up to solve those problems. There’s an enormous amount of work being done in early diagnostics, being able to screen cancers and find them when they’re small, before you have to do the big reconstructive type of surgery that the da Vinci excels at. What I’m so excited about is that we keep continuing that trend. We push cancer diagnosis further and further down the severity scale so it’s found earlier and easier and the things we can do will be very effective, a real surgical cure. They will be just like a little speed bump on somebody's life rather than hitting this brick wall.